Apparently, I've Been Domesticated: Tiling is Almost Complete! 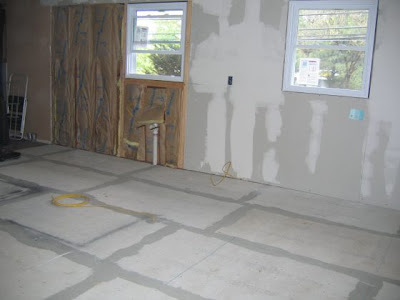 May 6, the contractor laid down the HardiBacker and sealed the joints with tape and thinset. 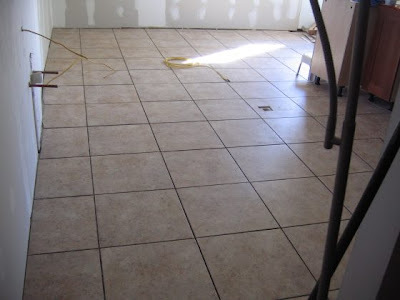 May 8, my dear friend Linda came by and started laying down the 18" x 18" Dal-Tile Passagio Sarano Brown porcelain tile. 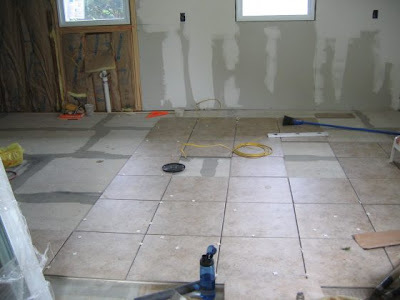 May 19, Linda stood in the rain and cut the tiles with the tile saw I rented from Home Depot that had a dull blade while Carol and I laid the tiles down. Apparently, they had a brand new machine there, but gave me the old crappy one instead. One of the many, many reasons I hate Home Depot. Anyway, they threw in the towel around 6pm, and I stayed up till 2am finishing up. Last night, I stayed up until 2am again grouting the floor. There's still a little hazing, so I'm going to mop it down with a vinegar water solution (I've read over at The John Bridge Forums...def the place to go for tile help...to use anything from straight vinegar to a 1:1 mix depending on how bad the haze is. 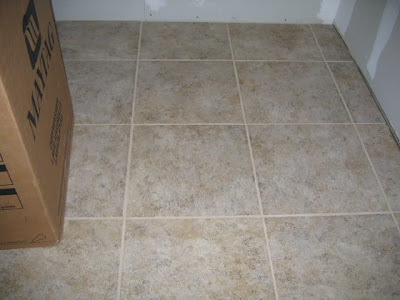 Also, don't let the vinegar sit around on the tile b/c it'll eat away at the grout. If you've used straight vinegar, it's a good idea to follow with a 1:10 ammonia to water mix afterwards to neutralize). Then in three days I can seal the grout and we'll be done! Well, with the floor anyway. My one tip to DIY tilers is to make sure you have tons of buckets. Hosing down buckets of thinset and grout isn't fun.